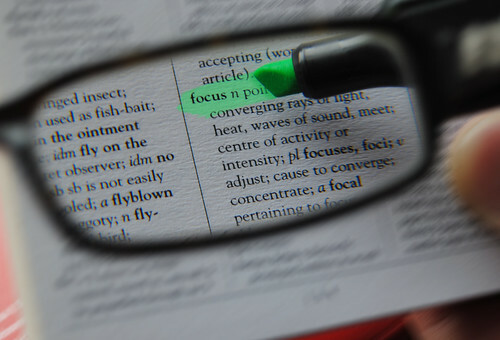 When I was riding my bicycle last weekend, I was thinking about the concept of focus. I had just had a conversation with my friend, who does long distance biking, about my shoulder soreness when bicycling, and she recommended that I ride differently to avoid this. So, during my ride, I focused on keeping my torso engaged, elbows in and guiding my direction rather than leaning on my handle bars. I rode for two hours with plenty of hills and without much discomfort. When a couple enters into the Collaborative Divorce Process, they are challenged to negotiate together about important family matters during a stressful time in their life, and in a manner that will bring the best results for their family. They are asked to identify goals, listen without reacting to the other person, tune in to their spouse’s interests, stay calm, explore options and decide outcomes. It takes focus to engage in relating to a one’s partner in a manner that may be different from one’s typical style when there is higher stress, uncomfortable emotions and differences in perspective. A Neutral Divorce Coach who is part of the Collaborative Practice Team, is the communication expert who can help couples see their unproductive communication patterns and assist them with becoming more skillful at listening to one another, speaking for one’s interests and combining their joint interests, so to move through the divorce process efficiently and with a plan that best reflects the goals they have identified. Changing behaviors or patterns of relating that lead to communication breakdowns, and practicing communication skills that lead to good solutions takes focus. Focus entails self observation, redirecting one’s attention to the goal, resetting one’s intention, and basically engaging in a form of mental training, so to create the best outcomes possible for the family. Divorce is a complex and a difficult transition for families. It takes a great deal of problem solving. Getting to the end with a good quality family plan takes focus. Next time I go out on my bike, I will again be directing my awareness inward and reminding myself to engage in good form, and tracking this as I go, in order to have a comfortable ride and an outcome that is on track with the goals that I have set. It takes focus.